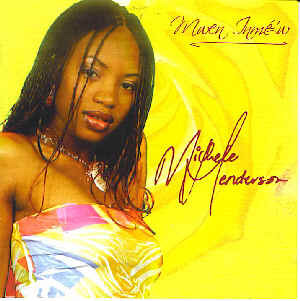 MWEN INME'W,(or spelled as Mwen Aimè ou),Krèyol(Creole) for "I love You", is the fourth CD album released by MICHELE HENDERSON.Originally released in Oct 2004, it was re-released in 2006. The title song among others is just sensationally rendered by Dominica's new female Superstar,Michele who has been following the footsteps of acclaimed Superstar, Ophelia. From Cadence to Zouk to Soul and Reggae and Bouyon, the diminutive star shifts from a dance oriented style of music to a concert style repertoire. The listener is treated to a creative and pleasing fusion of Creole styles and rhythms, jazz, R&B, and Hip-Hop on this project. Mwen Inme'w boasts a tribute to one of Dominica's well-known artists, Gordon Henderson of Exile One, appropriately titled Hommage (Track 6). Hommage is a medley of two of Gordon's popular compositions(Fraiche and Chanson d'Amour) and is the only cover version on the album; all other songs on the album were written by Michele with one other exception, Chante Ansamn (Track 8) co-written by Jean Luc Guanel. Mwen Inme'w also features former WCK front man Skinny Banton collaborating on Track 10 Bring it On.